Dam time to make an rpgmaker game about something or other. I wanted to try and make essentially harvest moon but hyper focused on townspeople events and characters. 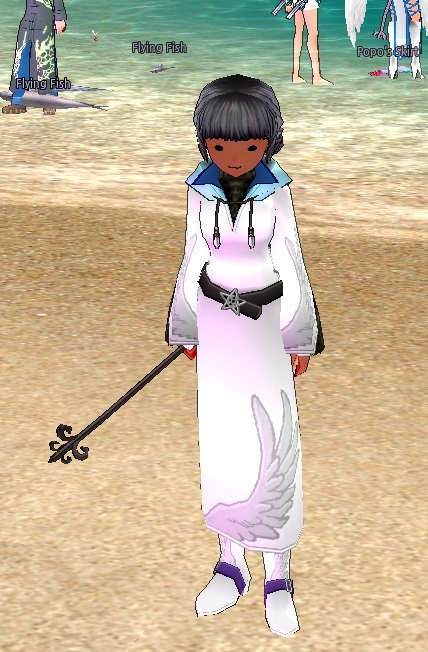 Anyone got some mabi avatar screenshots? I need npc designs. If I end up making them, I'll put them here. I managed to make a character base for running forward and side to side so now all I gotta do is slap some hair and clothing on the base to make new characters. Yay efficiency! I've noticed paint tool sai has a weird tendency to make things darker than if I save in photoshop. I got the free game maker already, and the black outline for now is to make sure I can see it. In the past I've had trouble with sprites blending into the background and at the 32x32 size, it's pretty hard to see anything. I've been fiddling with the screen resolution and making it larger might remedy that. is that a cat in her hat? somecoolguy wrote: Anyone got some mabi avatar screenshots? I need npc designs. If I end up making them, I'll put them here. TOO HARD. I'm just going to use various character avatars of people I know. The catblob hat witch is my friends avatar too. Its this kind of color scheme that makes me feel like everything will blend together with the background if i don't black outline things. If I make a wooden floor/ sand colored background, it'd look very much like a floating head. But who knows, I'll have to slap it in rpg maker with some background art and see. i don't think the black outlines are that big a deal personally, especially if the game is guna be bright/colorful/cartoony in general. otherwise at best id guess you could manage your backgrounds to not clash with anything too terribly. If you need a Mercenary or a Wandering Swordsmen you can use my character.